Revive your conservatory with these roof solutions! 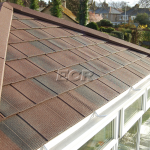 Your conservatory roof takes most of the weathering causing it to deteriorate & leak leaving it looking unsightly! Luckily you have the option to replace the roof plus you can change the material and design which will make it feel like a whole new conservatory. Whether you are looking to improve thermal efficiency and save on energy bills, repair damage to your roof caused by storms and bad weather or you just fancy a change, Exe Windows Doors & Conservatories specialise in replacement conservatories and roofs in and around Exmouth and Devon. We are very experienced in this area having tackled many old conservatories over the years and have the best technical knowledge of all our products plus great problem solving skills. Our business started as Exe Conservatory Repairs (a brand name we still use, see our sister website) and it still remains our favourite area in the business. Below is some information about different types of replacement conservatory roofs. The Guardian Warm roof system is an ever growing popular choice as it practically turns your conservatory into an all year round usable extension with it’s highly insulted lightweight tiled roof system. This system is the only LABC approved tiled conservatory roofs system and we are Devon’s verified installers. Their are similar products on the market but they may not be LABC approved. We offer a conservatory roof replacement service which means we can replace just your conservatory roof while leaving your existing windows and doors as they are. 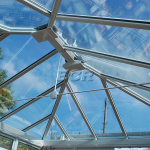 We test the structure of your conservatory making sure it is structurally sound, if so then you have the option of replacing your polycarbonate or glass roof with a new, more energy efficient and technically advanced glass roof. We use Celsius and Pilkington glass as they are the best on the market offering U-values as low as 0.9! (U-Value measures internal heat loss, the lower the number the greater the insulation) Celsius Performance Glass utilises Low-E and Solar control combination coating, with an Argon filled cavity, to control the amount of visible light, UV and heat that pass through the glazed unit. Easy clean technology is added to reduce maintenance requirements. Some of the great advantages of glass aside from aesthetics are, glass tends to have a longer life span and is easy to maintain, Traffic noise and rainfall is dramatically reduced compared to polycarbonate, Destructive UV rays are reduced thus offering protection for furniture and fabrics form sun damage and Easy Clean technology will require much less maintenance. We can replace your whole roof for a new one or we can just replace the glass units themselves. If you chose to replace your whole roof that would give you the option of changing the design too! This means that you can make your conservatory look like a brand new one! We have changed the design of many of our customers roofs! 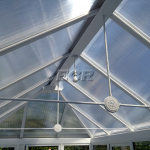 We use Longlife Multi-wall Polycarbonate sheets when replacing a conservatory roof or just the panels. The polycarbonate sheet is a lightweight insulating glazing material manufactured from damage resistant polycarbonate. Added Longlife protection provides resistance against the effects of UV weathering. Multiwall sheets are available in a range of thickness’s, structures and options for a wide range of roofing, cladding and glazing applications. There are a wide range of colours including clear, opal, bronze, blue, green, grey and heat guard. Dual tint sheets are also available in heat guard opal, bronze opal and blue opal. The choice of colour ultimately depends on the end result needed. Clear is used where maximisation of light is required. In order to take advantage of the heat build-up generated by the high level of light transmission clear is a popular option in colder climates. In hot climates other tint options, such as bronze, blue, green or heat guard, are more effective in limiting the amount of light and minimising glare. Where diffusion of light is required opal is the optimum choice. Opal prevents the sunlight from concentrating on one area, therefore eliminating hot-spots while allowing light into the building to keep it bright. It is a preferred option in supermarkets where it creates a soft light quality considered by many to enhance the retail environment. Some control of heat gain within a building can be achieved using glazing materials which are designed to influence the nature and quantity of transmitted light. Bronze and opal white tinting are both effective for solar control, reducing glare by diffusing incoming light and reducing heat gain. Longlife heat guard is an innovative development in polycarbonate sheeting which limits heat build up through the sheet while transmitting light. It is ideal in any situation where natural light is required but excessive heat build up can be a problem. The heat guard option utilises a specially developed pigment to significantly reduce heat build up below the roof. Under the sun heat guard acts like a mirror to reflect the heat thus reducing solar heat gain by up to 50%, when compared to other materials. This reduction in solar heat gain can help to reduce air conditioning costs. Heat guard opal also reduces solar heat gain by up to 50% however, the silvery grey colour is combined with an internal opal surface which creates a white finish and a soft light quality. Heat guard opal has a shading coefficient of 0.32 compared to 0.95 for clear material. Bronze opal combines a bronze external and opal internal surface.The external bronze surface blends discretely with other roof finishes while the opal internal finish provides privacy and soft light quality. Bronze opal combines the two most popular tint options. As you can see, there is no need to abandon and old conservatory, it just needs a bit of attention and a re-vamp. With the new products on the market these days you really can prolong the life of you conservatory or even turn it into a new room like an extension! The tiled roofs in particular have become very popular due to the fact that a conservatory can be changed very easily into an all year round living space in a matter of days. If the job starts on Monday you will be decorating it that weekend! Posted in Help & Advice and tagged Conservatory Maintenance and Repairs Devon, Conservatory Repairs, Exe Conservatory Repairs, New Conservatory Roofs, Revive your Conservatory with these Roof Solutions in Devon.